y Grandma and Jerry the roofer call the venting chamber on the ridge of the barn a Cupalo (Kew-pa-loe). I hadn’t heard it pronounced that way until last Monday when we re-painted it. It was rusty but the metal was still in decent shape, so we scraped as much rust off as we could with a wire brush and repainted it with Rustoleum’s Rusty Metal Primer, Rust -Block Enamel and Cold Galvanizing Compound on the bottom. I tried to match the barn red of the trim as best I could, but the color options were only brighter reds. So the barn now has a bit of a cherry on top. I didn’t like imaging the structure without it’s dapper finial, and though my Dad thought it should go, I fought to keep it. I have a hunch that re-furbishing the wooden ductwork connecting up to the cupola will more effectively cool the building in the summer than a new system installed. I didn’t want to install ridge vents along the spine of the roof in the event that I would someday be able to insulate and heat the hayloft. The air flow out the cupola could be easily shut off for the winter with some sliding panels. 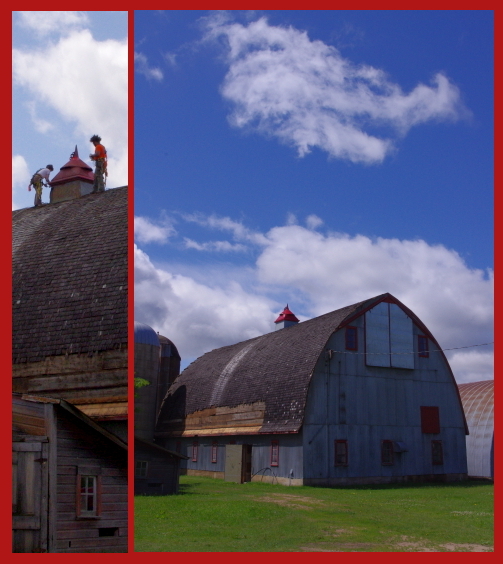 My siblings agree with me that it is strange to see the barn change in appearance.